If you have encountered any macOS 10.13 High Sierra problems, then this guide should help you, as we have the most common issues, as well as their fixes, so you can have your Mac up and running again as quickly as possible. It's worth noting that Apple has now released macOS High Sierra 10.13.1, which includes a number of bug fixes that should address some of the problems we've listed below. If you are encountering any problems with macOS High Sierra, we suggest you install 10.13.1 straight away. Read on for a full walkthrough of the process. However, there have also been reports about a major security flaw has been found in macOS High Sierra, which allows people to log into Macs running the software as an administrator without having to enter in a password. Because of the potential severity of this flaw, you should make sure you check out our guide on how to change the root password in macOS High Sierra, which walks you through a fix for the problem. If you’ve encountered a macOS High Sierra problem that we haven’t covered, follow and tweet us and we’ll do what we can to find a solution. From macOS High Sierra installation problems, to security risks and issues with making apps work, read on to find out how to fix the most common macOS High Sierra problems. As we mentioned earlier, Apple has now released macOS High Sierra 10.13.1, an updated version of High Sierra that includes a number of bug fixes and security updates that should fix a number of problems. To update High Sierra to 10.13.1, click on the Apple menu and select 'App Store'. From the App Store, click on the 'Updates' tab, and you should see 'macOS 10.13.1 Update 10.13.1' listed. Make sure you've saved your files, and backed up any irreplaceable files, then click on 'Update'. You can also download the macOS High Sierra 10.13.1 update from Apple's support site. A common macOS High Sierra problem at the moment is that macOS 10.13 begins to download, but then it pauses along with an error message that says “macOS High Sierra download has failed”. There are a few reasons why you may get this problem. 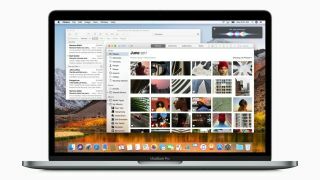 It may be because a lot of people are trying to download macOS High Sierra at the same time. If this is the issue, try again later to see if the download now works. It may also be worth switching from a Wi-Fi connection to an Ethernet cable, to ensure your internet connection is as reliable as possible. If you’re still having problems downloading macOS High Sierra, try to find the partially-downloaded macOS 10.13 files and a file named ‘Install macOS 10.13’ on your hard drive. Delete them, then reboot your Mac and try to download macOS High Sierra again. If you still have a problem downloading macOS High Sierra, open up the App Store, click ‘View My Account’ and see if there is anything in the ‘Unfinished Downloads’ section. You may be able to restart the download from there. Finally, try logging out of the Store to see if that restarts the download. If you’re having problems installing macOS High Sierra, first make sure you check out our how to download and install macOS 10.13 High Sierra guide, which will take you through the steps you need to take to safely install the new operating system. If the macOS High Sierra download completes, but there’s no prompt for the installation to continue, then search in your Mac’s application folder for a file called 'Install macOS 10.13'. Double-click the file to begin installation. You also need to make sure that there is enough hard drive space on your Mac, otherwise the macOS High Sierra install will fail. To fix the macOS High Sierra problem where the installation fails due to low disk space, restart your Mac and press CTL + R while it’s booting to enter the Recover menu. Select ‘Disk boot’ to boot normally, then remove any files you no longer need. If you’re struggling to free up disk space, look out for hidden Time Machine files that may be taking up large amounts of space. Once you have freed up enough space, retry the installation. If macOS High Sierra encounters a problem at the end of installation, and then shows an error message, restart your Mac and press Command + Option + R on your keyboard while the Mac boots to start up the recovery system over the Internet. You can also try Shift + Option + Command + R.
If your Mac continues to fail to boot, follow Apple’s instructions on creating an external Mac startup disk. It may be worth restarting your Mac in Safe Mode, then trying to install macOS 10.13 High Sierra from there to fix the problem. Quite a few people have contacted us saying that their macOS High Sierra installation fails with an error message that states "the path /system/installation/packages/osinstall.mpkg appears to be missing". To fix this, you will need to install macOS High Sierra from a USB drive. First, download the installer by opening up the App Store and go to the 'Featured' section. High Sierra should appear towards the top of this section. If you can't find it, use the search box, or click the link above. Once macOS High Sierra is downloaded, press Command + Q on your keyboard to quit the installation process. This will keep the macOS High Sierra installer app installed on you Mac in the Applications folder. Next, you'll need a USB drive over 8GB in size. If you don't have one, check out our list of the best USB drives. Make sure any files or data on the USB drive are backed up onto another device, as the installation process will format the drive. You'll now need the free Install Disk Creator app. Download and install the app, then connect your USB drive to your Mac and run the app. In the main menu there will be a drop down list box titled 'Select the volume to become the installer'. Select your USB drive. Underneath that, you'll see a box that says 'Select the OS X installer'. macOS High Sierra should already be selected, but if not, click on the box, then select the installer you just downloaded. Finally, click 'Create installer' and follow the instructions. When that's done, restart your Mac and hold down the Option key while it starts. This will open up the boot manager. Make sure you select your USB drive, then start the installation process. Some people are encountering a problem while installing macOS High Sierra where an error message saying "unable to unmount volume for repair" appears. If you have encountered this problem, first make sure you have a recent Time Machine backup of your drive. Check out our ultimate guide to backing up your Mac before continuing, to make sure you have a backup. Also ensure that the Time Machine backup is saved to a separate hard drive (or USB stick) from the drive you wish to unmount. Where we've put <number> enter the correct number for the disk you wish to unmount. Double check this is the correct disk if you're not completely sure, then press Enter. The disk will now be unmounted. To continue to install macOS High Sierra, open the Diskutil app within recovery mode and reformat the unmounted drive to APFS. Please note that reformatting the disk will remove all data from the drive. This is why it is so important to make sure you have a Time Machine backup before you complete this step. Next, complete the installation of macOS High Sierra, and restore your files using the Time Machine backup when prompted. If you've installed macOS High Sierra, but your Mac won't start, then restart your Mac and hold down Command, Option, P and R, which will reset the NVRAM (non-volatile RAM). Hold the keys down until the computer restarts and you hear the startup chime for the second time. Release the keys after you hear the second startup chime. The PRAM will be reset as well. While in Safe Mode, run Disk Utility to see if that will fix any macOS High Sierra boot problems. For other ways to fix a Mac that won't start, check out our guides how to Use OS X boot options to troubleshoot your Mac and how to fix a Mac that won't start. Some people have been reporting a problem where macOS High Sierra keeps randomly logging them out of their Mac. It’s annoying, but the good news is there’s a number of fixes for this High Sierra problem. First of all, go to Preferences > Security & Privacy > Advanced, and uncheck the box where it says ‘Log out after… minutes of inactivity’. In the Security & Privacy window, click ‘General’ and uncheck the box ‘Require password after sleep or screen saver begins’. Remember the security implications of this, however. If macOS High Sierra is logging you out while you’re using Chrome, try opening up the Chrome web browser and going to the settings. At the bottom of the screen click ‘Advanced’, then turn off hardware acceleration. Some people have noticed that a Guest Account has suddenly appeared in their login screen after installing macOS 10.13 High Sierra. This icon often has graphical artifacts that accompany the Guest User account. This appears even if you have not enabled guest accounts. Press 'Enter' on your keyboard, then enter in the password you use to log in to your Mac as an administrator. Now, restart your Mac and the icon will be gone. There have been issues reported of people experiencing problems connecting to the internet and Wi-Fi networks since upgrading to High Sierra. If you're encountering a Wi-Fi problem, first try turning your Wi-Fi adaptor off and on again. To do this, click on the Wi-Fi status icon in the Menu bar, then select 'Turn Wi-Fi Off'. Wait a few seconds, then select 'Turn Wi-Fi On'. If that doesn't work, you may need to change the name of the Wi-Fi network, and the password. To do this, you'll need to log into your Wi-Fi router. The method for doing this will vary depending on the make of router you have, so check the manual for your device before you begin. Also, making sure your SSID (the name of your Wi-Fi network) is not hidden can also help to fix this problem. One reader contacted us with this problem, and they fixed it by uninstalling a VPN app they were using. This may be worth trying as well. Another common macOS High Sierra problem is that some apps no longer work once you've upgraded to the new operating system. This is especially common if you are using older programs. If you find that an app you used to use no long works in macOS 10.13 High Sierra, the first thing you should do is check to make sure have downloaded and installed any recent updates to the software. You should also check the website of the software. This may contain updates or advice for getting your hardware to run. If your software is very outdated, it may no longer be compatible with macOS High SIerra. If that's the case, you should consider buying a newer version, or finding an alternative. What apps don't work with macOS 10.13 High Sierra? Here's a list of some of the apps that don't currently work on macOS High Sierra. If you use them, consider upgrading to a newer version. Adobe Photoshop CS4: Adobe has said it is not making sure this app is working in High Sierra, so best upgrade to the latest version to make sure. If your Mac is running noticeably slower after upgrading, there are a number of things you can try to speed up macOS High Sierra and fix any problems that are slowing it down. First of all, try restarting your Mac to see if that helps. If it doesn't, force-quit any apps that appear to be taking up a lot of RAM. You can identify these by using Activity Monitor (in /Applications/Utilities) to establish what apps and processes are using up the most CPU or RAM. Its CPU tab lists active processes, with a real-time view of what's going on. To force-quit an item, click it in the Activity Monitor list, click the X at the left of the toolbar, then confirm you want to force-quit. Also delete the cache. Open the Finder window, select 'Go' from the top menu and select 'Go to Folder'. Remove the data from inside every folder. Now repeat the process with /Library/Caches (without the symbol). Running the Repair Disk tool from within Disk Utility may also help, and for more solutions check out our How to speed up your Mac guide. Has the battery life of your MacBook become shorter since installing macOS High Sierra? This is a common complaint at the moment, so you can check to see what's causing the battery drain in macOS High Sierra by opening up the Finder, then going to Applications > Utilities > Activity Monitor > Energy. From there you'll see a graph with how much energy the programs you are running are taking up. If it's a lot, you may want to check to see if there is an update to make the software run better in macOS High Sierra. You may also want to uninstall the program and use an alternative. Turning off location services, or stopping unnecessary animations and graphical effects in macOS High SIerra can also help prolong battery life. For more advice, visit our how to improve your MacBook's battery guide, and watch our video below. A macOS High Sierra problem some people have reported encountering is that after the upgrade they have noticed their hard drives are showing a lot less free space than before. This will move the MobileBackups folder to your desktop. Now, drag and drop the folder into your Trash, then empty it. You should now find you have a lot more disk space available. We recently reported that there is a major flaw in macOS High Sierra puts your passwords at risk. The exploit was discovered by Patrick Wardle, chief security researcher at ‎Synack, and also affects earlier versions of macOS, and it can be delivered by an unsigned app. Apple should be working on a fix to this rather serious problem, but for now you should be extra careful when installing apps, and make sure that you only download them from trusted sources such as the App Store. We will update this section when Apple releases an official fix. Some people are reporting a problem in macOS High Sierra where notification banners are no longer showing when they receive new emails. To fix this problem go to System Preferences > Notifications and changing the alert style from 'Banner' to 'Alert' or 'None'. Next, change it back to 'Banner' and banner notifications should now work again. If that doesn't help, restart into safe mode (hold down the Shift key on your keyboard when your Mac is starting up to enter safe mode), and try sending a test email to yourself and see if the notifications work. If they do, restart into normal mode and try sending a test email again. If you have tried to delete an email but received an error message that states: "The IMAP command UID COPY (to Trash) failed for the mailbox INBOX with server error: UID COPY Command is not valid in this state", you may need to delete the email account from the Mail app, then add the email account manually. This seems to be an error that happens a lot with Yahoo Mail accounts in High Sierra. Hopefully Yahoo will come up with a permanent fix for this problem.